Note: the name "MediaWiki" is often confused with several other, similar, names; please see the glossary for an explanation of these. MediaWiki is wiki software, released under the GPL, that is used by Wikimedia projects and others. It is an implementation of a wiki, a content pool that anyone can freely edit. It is developed using Phabricator, our instance of Phacility's Phabricator. MediaWiki 1.31.1 is the latest stable version, and is recommended for third-party users. Those running their own servers should upgrade for security reasons. Special:Version shows what version a site is running. You can play around in the local Sandbox to see this version in action. 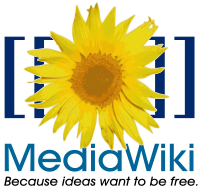 MediaWiki 1.31.1 is available for download from MediaWiki.org, a site that is also responsible for the documentation of the software. MediaWiki 1.34.0-wmf.1 (01a79c9) is currently running on all Wikimedia sites. Third-party users should probably not run the alpha/beta versions of MediaWiki on publicly accessible servers at this time. For downloadable dumps of Wikipedia's article database, see Wikipedia:Database download. For a description of the database format and fields, see database layout. To create your own dump of a local MediaWiki site, you can use the dumpBackup.php script found in the maintenance directory of your MediaWiki installation tree. Command line options for dumpBackup.php are explained by running it with no parameters, i.e. However, there are some extra undocumented options in its source code.